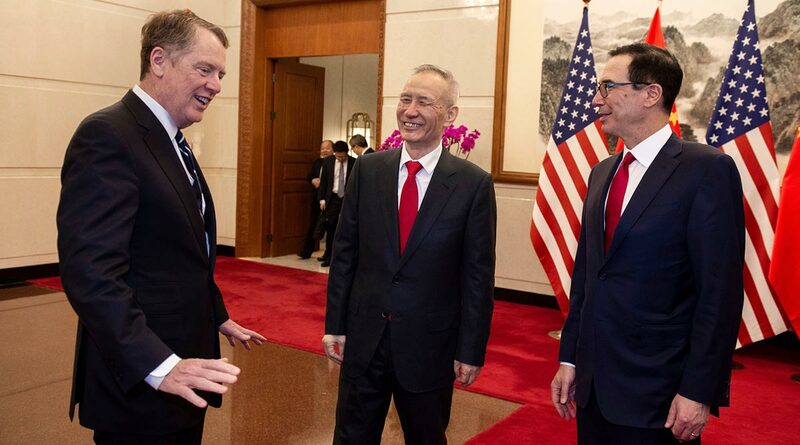 U.S. Trade Representative Robert Lighthizer and U.S. Treasury Secretary Steven Mnuchin held meetings in Beijing on March 29 partly to ensure there were no discrepancies in the English- and Chinese-language versions of the text, and also to balance the number of working visits to each capital, according to the officials, who asked not to be identified because the talks aren’t public. In a tweet, Mnuchin called the talks “constructive” and confirmed Chinese Vice Premier Liu He is due in Washington next week. Speaking March 29 on CNBC, White House Chief Economic Adviser Larry Kudlow said the sides made “good headway” and U.S. negotiators probably were on their flight back to Washington. The focus on the joint wording has become a key issue after U.S. officials complained that Chinese versions of the text had walked back or omitted commitments made by negotiators, the unnamed officials said. The sides have very different understandings of certain words, according to one of the officials, who noted that China’s vice commerce minister, Wang Shouwen, started his career as a translator at the ministry. Kudlow, who runs the White House’s National Economic Council, said the United States could raise tariffs if China doesn’t comply with an eventual deal. “If they don’t stick to it, there will be significant risks” to China, he said. At stake is a deal that could resolve a conflict that has roiled markets and cast a shadow over the global economy. Kudlow said the Trump administration is focused more on getting a good agreement than a quick resolution to the trade dispute. As China nears agreement with the United States, officials are keen to maintain an appearance of equality between the sides, which explains the focus on matching visits to Beijing and Washington, the people said. While talks have taken place by phone over the past month, the last face-to-face meetings took place in Washington in February. The key areas where the United States is demanding better terms include China improving treatment of U.S. intellectual property, opening up market access for American companies and agreeing on an enforcement mechanism for the trade deal, Kudlow said March 28. The United States wants regular meetings to assess whether China is living up to promises and wants to be able to impose tariffs on China — with no threat of counter-retaliation — if it fails to do so, he said. The U.S. focus on translation issues came after negotiators felt China was backtracking on previous commitments it made on IP and tech issues. After the latest round of face-to-face talks, Chinese negotiators frustrated U.S. officials by sending back text on IP with entire sections crossed out that had been agreed to by Lighthizer and Liu, people familiar with the situation said.